Where is Golden Ocala? 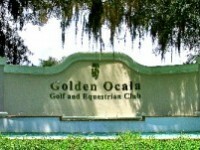 Golden Ocala Golf and Equestrian Club is an exquisite, private, gated community located on the Northwest side of Ocala off Hwy 27. Why do people like to live here? It is an exclusive golf community offering an 18 hole championship golf course designed by Ron Garl, an equestrian facility with 20 stall barn, bridle trails and jumping arena. The beautiful 2 story Southern Style clubhouse offers first class dining, a fitness center a relaxing spa and salon. This is luxury living at its best. Golden Ocala is very close to the new WEC that is set to open in 2020. This exclusive community offers spacious estate homes and large well appointed lots. There is no other community in Ocala like Golden Ocala. It is a one of a kind gem. I have a home here what is it worth? Please click here for a free market analysis and then we can discuss the best marketing plan for your home. I want to look at homes here. If you would like to see any of the homes available, please call me to schedule your private showing. I look forward to showing you this magnificent community. See list of available homes below. Lakeside at Golden Ocala! This expansive waterfront estate offers unlimited opportunities for relaxation and recreation at Golden Ocala's signature golf course, world class spa, dining and equestrian facilities. Experience quality timeless elegance. The formal living room has a fireplace, cathedral ceilings with a soaring glass wall showcasing the estates's incredible pool, landscaping, and panoramic lake and golf course views. The chef's kitchen features granite counter tops, center island, custom cabinets plus a breakfast nook overlooking the pool and open to the family room with a built-in entertainment center. Lastly there is an incredible pool area with complete with wading area, waterfall and lighting for your nighttime enjoyment. Be ready to be impressed.